Is grammar simply some sort of loose set of rules that we casually try to stick to and then use as fodder for Twitter jokes, or is grammar actually something much more meaningful and impactful on our daily lives? This post is a departure from anything networking; instead, I’ll be looking at the relationship between formal language, governed by grammatical conventions, and our perception of and negotiation with reality. When you read the word tree, I’m sure you immediately understood some concept of a tree. Maybe you thought of an oak tree whereas another reader thought of an elm. My family vacation is fast approaching, so I thought of a palm tree. However, we all understood something inherently the same: treeness. The essence of what we agree a tree is can be communicated by a simple arrangement of lines on a screen. 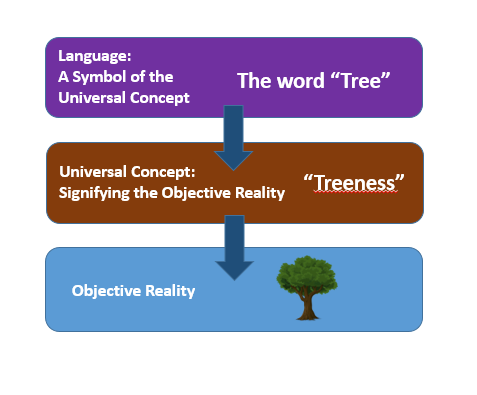 However, the word doesn’t symbolize a tree; it only symbolizes the concept of a tree that our society has agreed is the correct association for the word. The word tree symbolizes treeness, or some vague notion we all agree upon of some object with a trunk, branches, and some type of leaf structures. Therefore a word is a secondary symbol signifying a concept which only imperfectly symbolizes an objective reality. Put another way, the word tree isn’t a tree, and it doesn’t even symbolize that tree outside your window right now. It symbolizes the concept of what we both agree a tree is. This is getting deep, but please follow with me. In this example we can understand that we deal with the objective reality outside of ourselves by labeling it and creating abstract constructs to interact with it. We do this using language. This may be language in the familiar sense such as English, Italian, French, or whatever spoken and written language you can think of. However, we can also consider music, hand gestures and other art forms as types of languages. In other words, we use something to signify a concept which then symbolizes an objective reality. If this is true, then the accuracy of a language, its proliferation in a society, its construction and its diversity is directly related to one’s ability to negotiate with the reality around them and the internal conversation happening within. Grammar, defined as the logical constructs used to organize and give meaning to otherwise random lines on a page or screen, is therefore absolutely vital to a person’s successful interaction with reality. Our minds try to create some sort of meaning out of the explosions of thought and external stimuli occurring continually. Resulting in self-awareness and consciousness, this process is akin to a never-ending movie playing in our minds. However, this movie must exist in some sort of framework. How can we think about a thing without being able to identify and refer to it? We think in a language: words arranged in a logical system that most people in a society agree upon. The greater one’s vocabulary, the better they are at cataloging reality. The greater one’s ability to create a logical flow of words, phrases, and sentences, the better they are at synthesizing information into thought for the process of internal or interpersonal communication. Keep in mind that when I speak about an objective reality, I mean the physical world such as trees, rocks, cars, and books, but just as real are concepts such as love, freedom, jealousy, and justice. How, without a strong grasp of how to manipulate an arrangement of lines and swirls on a page, can you accurately convey the concept of justice? How, without a strong grasp of how to manipulate your vocal chords, mouth, and tongue in order to create audible sounds, can you utter the concept of of freedom? Our language is therefore the mediator between us and reality. The rules of grammar, then, are extremely important to effective communication. Grammar is the essence of the logical system of language, which I hope by now you agree is the basis of how we understand and negotiate with the world around us and with the world within. This means that grammar is part of the foundation for understanding and negotiating with reality. However, if I say to my wife, “sweetheart, I love you as much as the sky is wide and the ocean is deep”, she might respond a little differently. In the second case I used a simple literary device, an extended simile, to convey an abstract concept – reality – that transcends one or two simple words. A person with a strong grasp of their language and how to effectively manipulate it can more effectively communicate with others. And, considering we are always carrying on an internal dialogue with ourselves, our grasp of language and how to effectively manipulate it also enables us to think more clearly and carry on our internal conversation. Have you ever read something that required you to stop and reread the paragraph because you had no idea what the author was trying to communicate? Sometimes that’s because the concept is difficult to understand, but more often that not, the reason is that the grammar is so poor that it impedes comprehension. The rules of grammar that our society have agreed upon actually assign meaning to the random arrangement of secondary symbols on the page. In fact, the deeper the understanding, the greater the ability to manipulate them in such a way as to convey meaning that is otherwise nearly impossible to communicate. For example, how would you write something in such a way as to cause your reader to stumble through the sentence yet not lose any of its meaning? In English, we don’t write using scriptio continua, or in other words, without the use of space between words or sentences. A clever poet, however, can break the traditional rules of grammar and use this writing technique to force the reader to read a sentence quickly and almost stumble through it. Therefore, our rules of grammar affect the meaning we derive from a text. Mull over these two questions: if our comprehension is thwarted by someone else’s poor grammar, are we doing much more than looking at a series of random lines and swirls on a screen? And lastly, how does our own poor grammar affect the internal conversation we’re always having with ourselves?